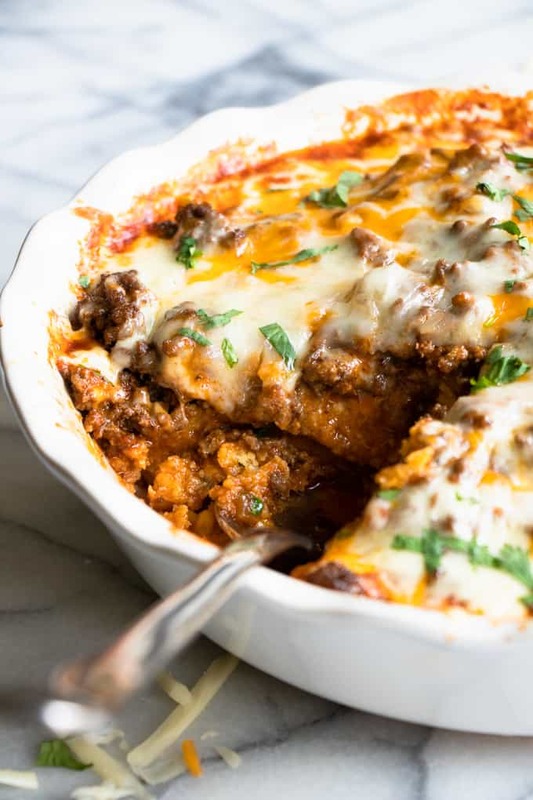 Tamale Pie is a juicy ground beef on top of a cornbread crust, all drenched in a bold enchilada sauce. This casserole recipe is an easy spin on tamales making it perfect for a weeknight dinner. 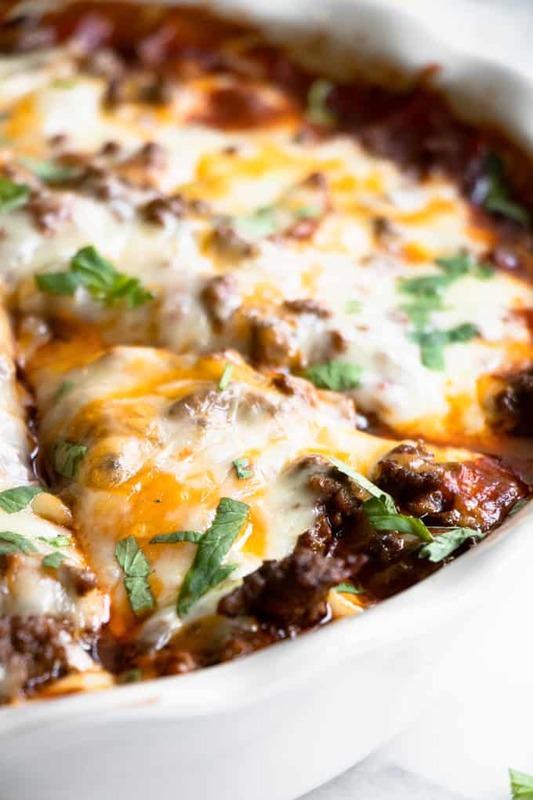 This Tamale pie is bold and flavorful! 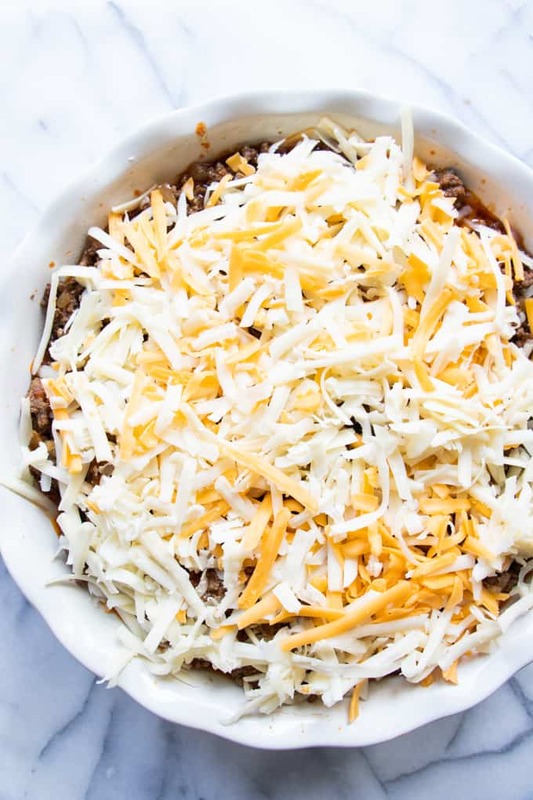 Loaded with ground taco meat, and lots of melted cheese, this is a dish the entire family will love! Plus it’s easy to make ahead, instructions are below. Serve this alongside some Chilled Cucumber Tomato Salad, or some Southwest Quinoa Bean Salad, and finish the meal with a slice of classic Tres Leches Cake! Hey y’all! Serene back from House of Yumm. This classic casserole recipe is a family favorite! I have made so many versions of this dish, and I have a Green Chile Chicken Tamale Pie version on my site, if you want to see how you can change up the toppings. Basically we will make a cornbread crust that mimics the texture of the masa in tamales, and we can load it up with any topping of our choice! 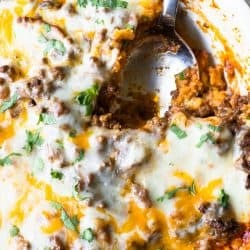 This particular recipe I’m sharing with you today has my favorite taco meat and a top layer of cheese. This also happens to be my family’s favorite version too! Prepare the cornbread crust. Mix together the dry ingredients in a large bowl. These include cornmeal, all purpose flour, baking powder, and salt. Stir these with a fork to combine. Add the wet ingredients. No need to premix the wet ingredients, this can all be done in one bowl. Add the egg, sour cream and corn to the dry ingredients and mix. Pre-bake the corn bread crust. This will bake the cornbread partially. Poke and drizzle with enchilada sauce. Add toppings and bake again. This is where we will add the ground beef, cheese, and whatever other toppings you want to include with your tamale pie. Tamale pie is basically a casserole, or pan version, of a classic tamale. It’s perfect for serving larger numbers, either a large family or to take to a potluck or gathering. The cornbread crust is poked and drenched with enchilada sauce, then topped with ground beef, or other topping of your choice. As this bakes it gives the cornbread crust a moist, tender texture that is similar to the masa that surrounds tamales. What goes with tamale pie? This easy casserole recipe is perfect for family dinner. Some sides that pair well would be Pinto Beans and Mexican Rice. Some great topping ideas would be some homemade easy salsa, or guacamole. Can I prep this tamale pie recipe ahead of time? This tamale pie can be made ahead of time and stored in the refrigerator to be baked later, or it can be frozen and kept for 2-3 months. To prepare this meal ahead of time, follow the directions for making the cornbread crust and the topping ingredients. Pre-bake the crust, then add the toppings. Cover with foil and store in the refrigerator until you are ready to bake for dinner. Before baking, set the casserole on the counter to come to room temperature for about 10-15 minutes. Then bake in the oven at 400 for 30 minutes, or until the top is melted and the sauce is bubbling. 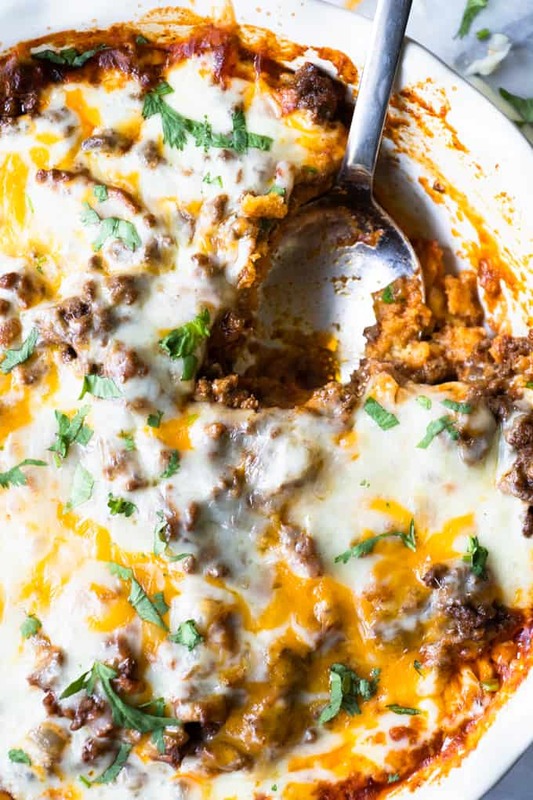 If you’re wanting to freeze this tamale pie for a later date, follow the directions above for preparing the casserole ahead of time. Except store the tamale pie in the freezer. Be sure that it is in an airtight container. If covering with foil, let it freezer for about an hour, then place the pie dish in a sealed freezer bag. This can be stored for about 2-3 months. When ready to cook, remove from the freezer and place in the refrigerator the day before, to allow it to thaw, or you can place it on the counter to come to room temperature about 1 hour before cooking. Tamale Pie. Juicy ground beef on top of a cornbread crust, all drenched in a bold enchilada sauce. This casserole recipe is an easy spin on tamales making it perfect for a weeknight dinner. Mix together the dry ingredients in a large bowl. These include cornmeal, all purpose flour, baking powder, and salt. Stir these with a fork to combine. Add the egg, sour cream and corn to the dry ingredients and mix. Pour the cornbread mixture into the prepared baking dish. Bake the corn bread for about 15 minutes, it won’t be done completely, but it will bake more once we layer everything on. 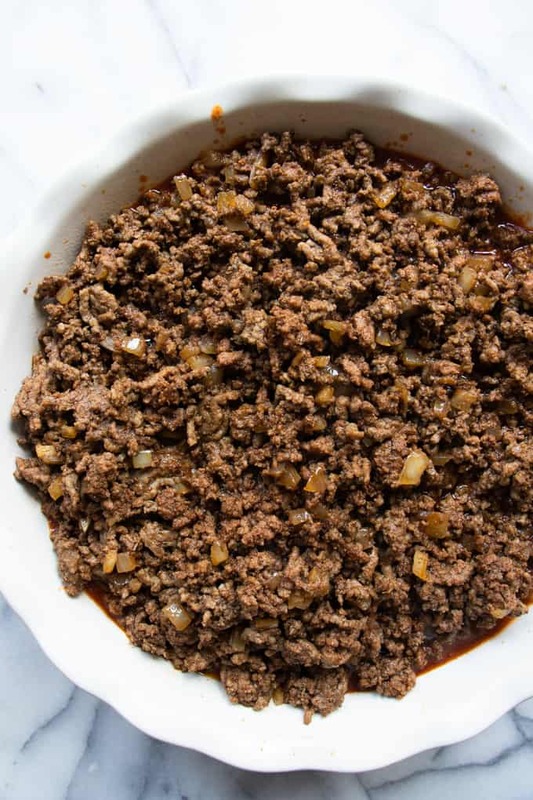 While the cornbread bakes, prepare the ground beef. Cook over medium heat in a skillet, once the meat is cooked through, no longer pink, drain the grease, add the seasonings and stir to combine. 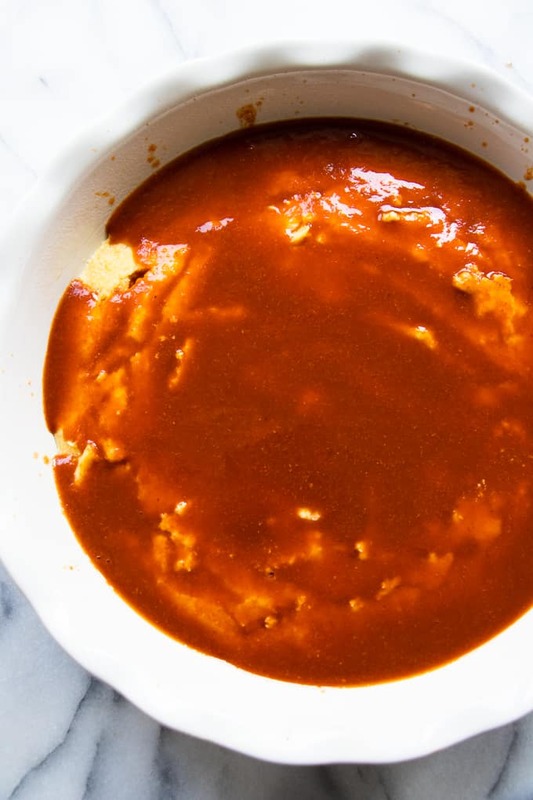 Poke the cornbread with a fork all over and drizzle with enchilada sauce. Add the ground beef on top of the cornbread, then top with the shredded cheese. Bake again for another 30 minutes until the top is melted and bubbling. The sauce will be bubbling along the edges of the baking dish. Remove from the oven and allow to cool for a few minutes before serving. If you are looking for a shortcut, you can replace the homemade cornbread dry ingredients with one box of Cornbread mix. Add the same wet ingredients to the mix and follow the rest of the recipe. Previous PostPrevious Chicken Spaghetti: A New Family Favourite!